Notes: The third Canning Town was a major complex comprising a bus station and platforms for the North Woolwich line, Docklands Light Railway and Jubilee Line. 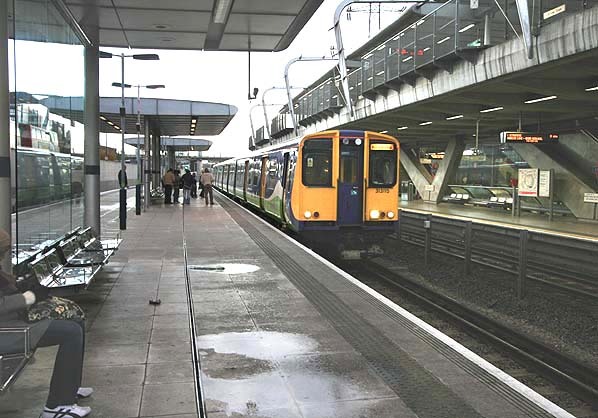 The North Woolwich trains were served by an island platform a littler to the south of the site of the first Canning Town Station. In 1833 a railway line was proposed from Limehouse, to the north bank of the Thames opposite Woolwich. Nothing came of this scheme but in 1842, George Parker Bidder put forward a proposal to link the Eastern Counties Railway at Stratford with the Thames to enable seaborne coal to be distributed throughout East Anglia. Bidder's scheme was incorporated by Act of Parliament in 1844 as the Eastern Counties & Thames Junction Railway, with powers for a line from Stratford to a terminus on the Thames near the mouth of Bow Creek. It was opened between Stratford and Barking Road on 29th April, 1846 and was purchased by the E.C.R. in August of that year. Meanwhile, in 1845, an Act had been obtained for the North Woolwich Railway, which was to extend the Thames Junction line to a point on the river opposite Woolwich. Despite opposition from the Board of Trade the bill was passed as the line would provide access to Woolwich and its arsenal which at that date was without a railway connection. After completion, the North Woolwich Railway was bought by the E.C.R. in 1847 and the 21 mile line was opened on 14th June, 1847, together with a curve to the main line at Stratford, enabling through trains to be run between the Eastern Counties terminus at Shoreditch and North Woolwich. There were two intermediate stations at Stratford Bridge (later Stratford Market) and Barking Road (later Canning Town). The branch quickly proved popular and an hourly service was established between Shoreditch and North Woolwich where two steam ferries, owned by the railway, provided the connection to Woolwich itself. The line was extended northwards to a junction with the North London Railway at Victoria Park on 15th August 1854, to accommodate these trains; a new station was opened at Stratford Low Level. On 31st March 1858, the London Tilbury & Southend Railway opened a loop to the North Woolwich line at Abbey Mills providing a route into Fenchurch Street. In 1849 the South Eastern Railway opened their line to Woolwich resulting in a huge loss in revenue to the North Woolwich line. In an attempt to gain revenue there was some development around the remote North Woolwich terminus. Silver & Company established a factory adjacent to the line and prospered to such an extent that the locality became known as Silvertown. In 1850 the Victoria Dock Company was authorised by Act of Parliament to construct a dock east of Bow Creek and immediately north of the railway. The entrance to the dock cut across the railway and to avoid disruption to traffic the North Woolwich branch was diverted around the north side of the dock, to rejoin the original line about three-quarters of a mile west of the terminus. A station was opened on the new line at Custom House. The original line was retained to provide railway connections to the numerous factories which sprang up along the river bank crossing the entrance to Victoria Dock by a swing bridge; it was known as the Silvertown Tramway. Victoria Dock opened in 1855 and was an immediate success with its direct connection to the Great Eastern Railway. The district surrounding the railway quickly prospered with new stations opening at Tidal Basin and Silvertown. In 1862 the E.C.R. merged with other lines to form the Great Eastern Railway. In 1874 the Beckton gasworks company opened a single-line branch from Custom House to their works and in 1880, another branch was opened from Custom House to a terminus at Gallions close to the dock basin where the P. & O. liners berthed. In 1864, the Victoria Dock passed to the London & St. Katherine Dock Company, which, in 1880, opened the Albert Dock as an easterly extension of the Victoria; it was joined to the latter by a short cut. It was again necessary to divert the North Woolwich line and an 1875 Act gave the dock company powers to divert the loop line through a tunnel under the cut between the two docks. The original line was retained as the high-level route owned by the dock company but in the event of the tunnel becoming impassable through any cause, the Great Eastern the right to use the original route free of charge until the tunnel was again fit for use. In 1872 the Great Eastern Railway opened a new line from Bethnel Green to Stoke Newington and Lower Edmonton with a branch from this line at Seven Sisters opening to Palace Gates in 1878. On 1st January 1880 a new spur was opened allowing a new service to be established between Stratford and Palace Gates, this service later ran through to North Woolwich. Both the Gallions and the Beckton branches were closed to passengers on September 7, 1940. Tidal Basin Station was closed to all traffic from 15th August 15 1943 after it was damaged by enemy action. Freight traffic to and from the docks was also affected inevitably by the war. In the early war years labour and equipment were transferred from London to other ports, but in 1944 preparations for D-Day put a heavy strain on the railways feeding the London docks. After the war passenger numbers were in decline with commuters finding the busses and trolleybuses more convenient; freight traffic was initially less affected but road haulage was beginning to make significant inroads. Passenger trains continued to run between Palace Gates and North Woolwich with short workings to and from Stratford Low Level. Stratford Market Station closed in 1957 and weekend services were withdrawn shortly afterwards. The service between North Woolwich and Palace Gates was withdrawn in 1963 and by the mid 1960's freight traffic had dwindled away to almost nothing and one by one the local goods depots were closed with the final blow coming in the late 1960s with the rapid decline of their docks. The goods service was withdrawn from North Woolwich in 1970 and the passenger service was expected to follow with the line east of Custom house being reduced to single track. A reprieve came at the end of the 1970's when the GLC joined forces with British Rail to revitalize the North Woolwich line by extending the service from Stratford over the freight only North London line to Dalston Junction. The line between Stratford and Dalston Junction had not seen a passenger service since 1943. 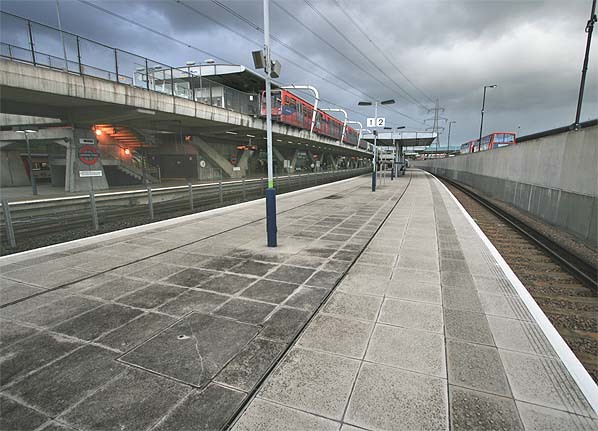 New stations at Hackney Wick & Hackney Central were provided and all the stations between Stratford & North Woolwich were rebuilt. At North Woolwich this included the closure of the 1854 Grade II listed building. A new entrance building was provided on the south side of the line and the track re-laid into the southern platform to serve it. A new station provided at West Ham for interchange with the District Line. The old station building and down (northern) platform were acquired by the Passmore Edwards Trust and after renovation the Old Station Museum was opened by the Queen Mother in November 1984. 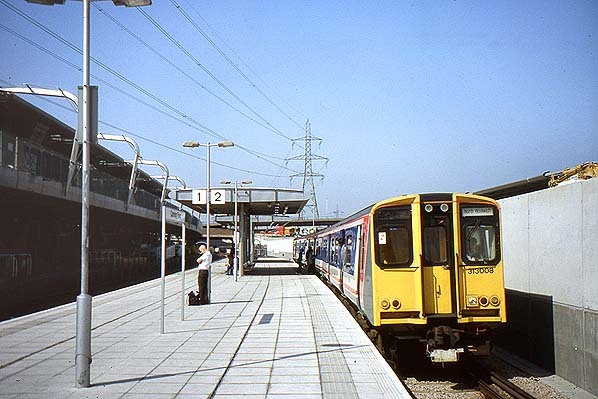 In May 1985 the line between North Woolwich and Dalston was electrified with a new service introduced between North Woolwich and Richmond with the resumption a full weekend service. Despite this huge investment in the North Woolwich Line its future was not secure. With the expansion of the Docklands Light Railway the line between Stratford Low Level was closed on 9th December 2006. The section between Royal Victoria and Stratford has been handed over to the DLR and will be rebuilt as an extension to the DLR between Royal Victoria and Stratford International, due to open in 2010. The section between Custom House and North Woolwich was closed completely as both North Woolwich and Silvertown stations are within 300 yards of existing DLR stations. There are proposals to hand much of this section of the line over to Crossrail who will incorporate it into their route but construction is unlikely to begin until at least 2013. In the meantime the Old Station Museum at North Woolwich is due to be cleared of its exhibits and archive and the Grade II listed building will be handed over to The London Rail Heritage Centre who are proposing to run a heritage rail service between North Woolwich and Custom House and a rail school until the land is required. This will include the building a new servicing facility on part of the former goods yard.